The drones have, amongst others of course, the duty to first attract diseases in the hive on themselves in order to keep them away from the bees. This shows that the drone brood must be designed for the needs of the bees and not as we want it! The bees conventional (5.4 mm cell size) happens to be almost as large as the drone of small cell bees. Therefore the varroa confuses bee brood with drone brood in the large cell bees, this means she thinks that the drone brood is bee brood. Also in the Asian bee, which builds small cells, the varroa prefers the drone brood. Dee calls this the pseudo-drone effect. And then it suddenly increases explosively in our large cell hives, where it settles in the bee brood. I found up to 200 mites in the drone cells and could not proof any within the bee cells. 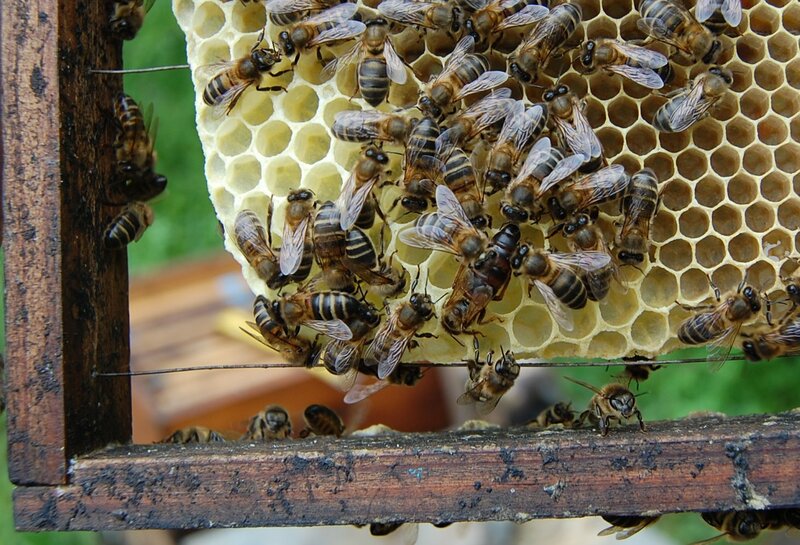 That changes, of course, in autumn and spring when there are no more drones in the hive and the Varroa is forced to move into the bee brood, where the bee then begins to clean the infected cells – if they have learned it! So it is clear that we need to find out how much and where bees want to have their drone brood. As you know, the mites prefer cooler areas of the hive. Experience has shown that each comb may not accommodate more than 10% drone cells. Therefore Dee leaves half an inch between each foundation sheet, where the bees can breed drones or not, up to the way they want. We cut a corner out of every foundation sheet, no matter which side, and then that is usually where drones are bred. The area of this corner is about 6% of the entire comb and measures approx 12cm x 8cm, what corresponds to what Dee Lusby leaves free below each foundation sheet. We need to teach the bees to again keep these proportions. We achieve this through selective breeding, because they have apparently forgotten with the use of artificially produced middle walls over the last 100 years. 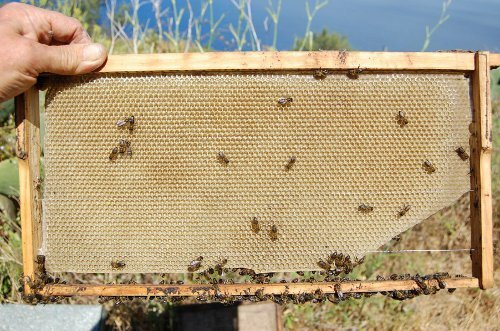 If the bees would fill a honeycomb that only has a thin strip of wax welded on, entirely with drone brood, it would fatal for the colony. We never have to apply this technique with the ‘Varroa Drone catch comb’ (or whatever it is called). 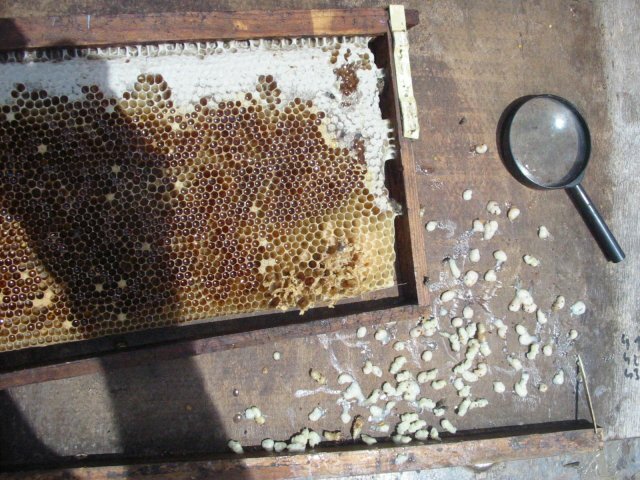 I’ve also had hives that would perfectly built the small cells (which sometimes can be problematic with strong honey flow) and were showing bald headed brood, but built almost no drone cells. That was the opposite extreme and then they soon developed the virus of deformed wings – without a chance. 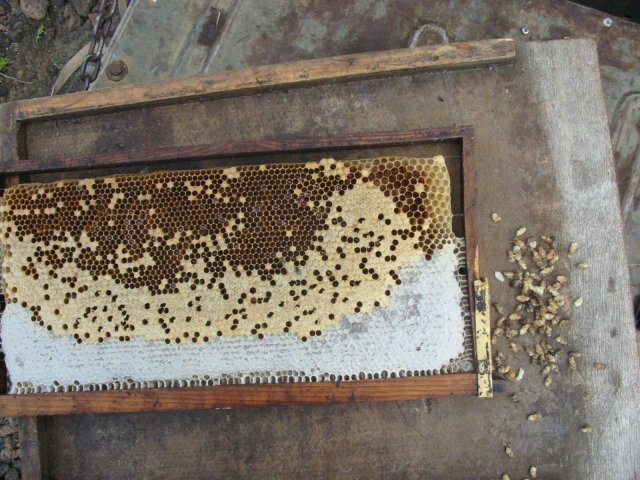 We need to adopt the habit of moving combs with more than 10% Drone brood to the sides and top of the hives at each inspection of the colonies, where the bees will fill them with honey and then sort them out. Do not just take them out, because one may think that it is a good way of getting rid of a many mites. I've already made this mistake in the beginning. The varroa mites nicely remain in the drone brood, but if we suddenly decimate the drone cells it will cause problems. You can now see that selective breeding is a key component. But more on this later. Dee has taught us some tricks here, without them you’ll have a hard time to cope. E.g. 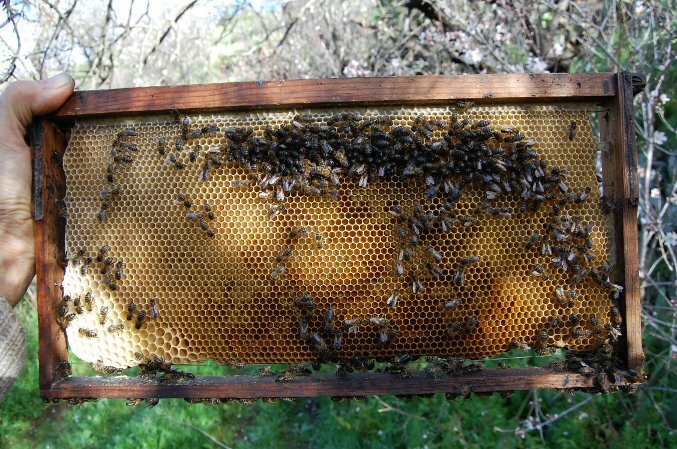 She showed us how, in an area with foreign hives, we can selectively mate the new queens with our own drones only. And how to change the queens of more than 50 colonies in the same day. But more on this later. Another thing is the problem of the tracheal mite, Acarapis woodi. When I arrived 25 years ago here on the island of La Palma, nearly all the bees perished due to the trachea. Then the beekeepers applied menthol and it went upwards again - until the varroa arrived. In the bees that hatch of 4.9 mm cells, the foremost part of trachea, or the frontal trachea opening, by which these mites can get into the inside of the bees, is so small that the mites no longer fit through - QED. Dee Lusbys bees had this problem in the beginning and it disappeared drastically once the cell size was reduced.